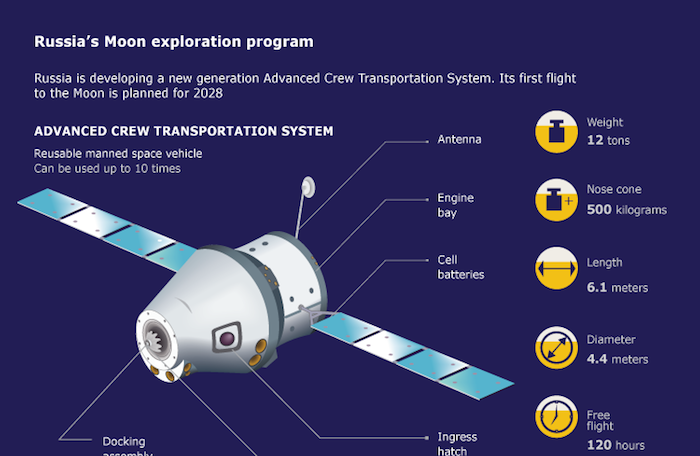 Russia is developing a new generation Advanced Crew Transportation System. Its first flight to the Moon is planned for 2028. Russia's new piloted spacecraft currently being developed by the Energia rocket-and--space corporation will feature a modernized docking system that has been used for over 50 years in the Russian space exploration, the press service of the corporation said Monday. According to the press service, the chosen docking system is already used in the Russian International Space Station (ISS) modules, Soyuz and Progress spacecraft, while the American ISS modules, Cygnus and Dragon spacecraft, the Jpanese HTV space vehicles use a common docking mechanism incompatible with the Russian systems. The re-entry capsule of Russia’s new generation manned spacecraft will have a life cycle of ten missions, while the engine section will be disposable, the former chief of the space rocket corporation Energiya, the ex-chief of the firm commissioned to design and make the new space technology, Vitaly Lopota, told the media, adding that the costs of the project were estimated at $105 million. “The spacecraft will be reusable. Its lower part — the engine section — will be disposable, while the re-entry module will be used ten times,” Lopota said. It is expected that the new spacecraft will be launched from the Vostochny spaceport, which is currently under construction. Lopota recalled, however, that no delivery vehicle was available for the spacecraft at the moment. “Equipped for remote flights the spacecraft will have a mass of 20 tons, so it will require at least a 75-ton delivery vehicle. A future spacecraft will replace the current workhorse — the Soyuz. 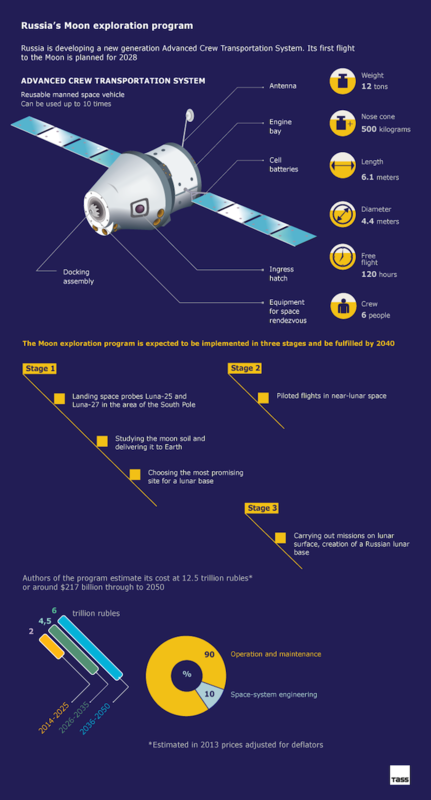 It is expected to take a crew of six into near-earth orbits and a crew of four to the Moon. Research into the project has been underway since 2009. Originally the first unmanned launch was scheduled for 2015, and a manned launch for 2018. The dates have now been moved to 2021 and 2024 respectively.